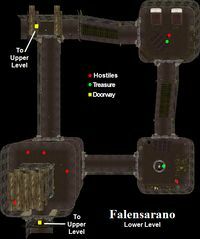 Falensarano is a Dunmer stronghold in the southern Grazelands. 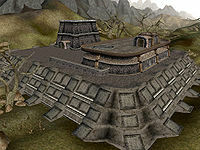 It is one of the ancient strongholds of a brighter time for the Dunmer, located in the southwestern corner of the Grazelands region. The strongholds seem interesting to the traveler, but should be approached very carefully. They have largely been abandoned, but have since generally proved attractive to whatever group feels strong enough to hold them. At last report, Falenserano has been taken over by a coven of witches and their summoned Daedra. Also living in the stronghold --and wisely leaving the witches alone (given the unfortunate fate of so many of his compatriots in their dealings with witches)-- is the Nord warrior Alfhedil Elf-Hewer, renowned master of the Axe, who is more than willing to train all passers-by in its use. In addition to Axe, Elf-Hewer also provides major training in Blunt Weapon, and Medium Armor. 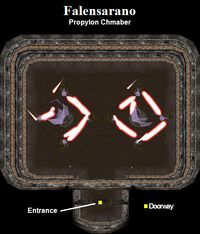 Falensarano has a Propylon Chamber linking to Telasero and Indoranyon. The Falensarano Propylon Index can be found in the Forgotten Shrine of Maelkashishi near a skeletal corpse on an alcove in the ceiling. This location also appeared in The Elder Scrolls Online. This page was last modified on 12 October 2018, at 23:20.